If you are working on any large organization’s Sitecore project then certainly you have to integrate Sitecore with other existing external system. This is the real challenge where you have to study their external system and find the way to integrate it with Sitecore. Recently I come across with one situation where we have to show search result both from Sitecore and external system. Getting search result is not a big deal but how to integrate it with Sitecore. So we have created indexes of external system and merge with Sitecore indexes. This technic is working fine but now client want it should show search on real time basis. Now this is the real technical challenge. Indexing is very costly process and scheduling in off- hour is fine but how to do it on real time? After thinking a while on this situation, I was able to get the solution. External system is referring SQL server database. 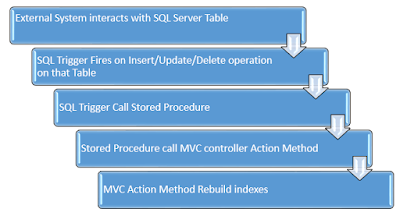 So I decided to create trigger which call stored procedure which finally call MVC method and run the rebuild index code. This is just a pseudo code. You can refer my article “How to rebuild index programmatically in Sitecore” for more detail on how to rebuild Sitecore indexes? For implementing security check, I am passing token so that this rebuild indexes code will run only with matching passcode. For testing purpose, I am also logging all the request details in file which help us to understand that our method is running properly or not. Run below script for creating a demo table. Specify the URL properly in SQL format. Note: - You can also use web service URL. But I found more complication with web service. So my suggestion is to use MVC method than web service. SQL Server blocked access to procedure 'sys.sp_OACreate' of component 'Ole Automation Procedures' because this component is turned off as part of the security configuration for this server. A system administrator can enable the use of 'Ole Automation Procedures' by using sp_configure. For more information about enabling 'Ole Automation Procedures', search for 'Ole Automation Procedures' in SQL Server Books Online. SQL Server blocked access to procedure 'sys.sp_OAMethod' of component 'Ole Automation Procedures' because this component is turned off as part of the security configuration for this server. A system administrator can enable the use of 'Ole Automation Procedures' by using sp_configure. For more information about enabling 'Ole Automation Procedures', search for 'Ole Automation Procedures' in SQL Server Books Online. SQL Server blocked access to procedure 'sys.sp_OAGetProperty' of component 'Ole Automation Procedures' because this component is turned off as part of the security configuration for this server. A system administrator can enable the use of 'Ole Automation Procedures' by using sp_configure. For more information about enabling 'Ole Automation Procedures', search for 'Ole Automation Procedures' in SQL Server Books Online. SQL Server blocked access to procedure 'sys.sp_OADestroy' of component 'Ole Automation Procedures' because this component is turned off as part of the security configuration for this server. A system administrator can enable the use of 'Ole Automation Procedures' by using sp_configure. For more information about enabling 'Ole Automation Procedures', search for 'Ole Automation Procedures' in SQL Server Books Online. You should get below successful messages by executing above configuration statements. Configuration option 'Ole Automation Procedures' changed from 0 to 1. Run the RECONFIGURE statement to install. Please leave your comments or share this Sitecore lesson if it’s useful for you.